The BMW Stakes will act as a great lead up to the much more high-profile and high-earning Golden Slipper on Saturday, with Gai Waterhouse’s Melbourne Cup winner Fiorente lining up for the race, joined by some top Australian runners. Roger James’ Silent Achiever and Murray Baker’s New Zealand runner It’s A Dundeel are formidable opponents for Fiorente, with both horses having gotten the better of him recently, and the 2,400-metre race will get the best out of these runners. 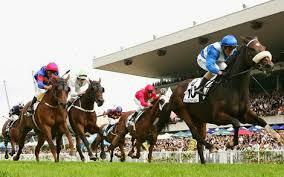 The race ranks second only to the Golden Slipper at Rosehill, and is one of the top staying races in Australia, and is the culmination of the spring season for many horses. The best place to have a bet on the 2014 BMW is with Bet365.com. The odds below were taken from the site, and you will be able to find the latest race odds there as well. Bet365.com is also offering each-way betting on the race, with which you will receive 1/4 if should your selection place in positions one to three. Fiorente disappointed many with his performance in the Ranvet Stakes in his last start, finishing unplaced behind BMW rival Silent Achiever. That race was Fiorente’s first win since his Cox Plate win last year, and would have been cause for the Waterhouse camp, but his track work on Tuesday brought some degree of confidence to his team, as the favourite looked in better shape and put in a good time. Fiorente nonetheless has had a decent season, claiming victory in the Australian Cup at Flemington. Silent Achiever, on the other hand, has won three in a row now. In addition to his Ranvet Stakes win, his other Group 1 win of these three wins was in the 2000-metre New Zealand Stakes, and his current will be cause for much optimism in James’ camp. It’s A Dundeel, the other major contender for the race, finished third in the Ranvet Stakes, and has placed in in his last two starts. As for the rest of the field, some interesting outsiders are an idea for a placed finish, including Voleuse De Coeurs, who was fifth in the Australian Cup and has won a Group 1 race in Europe, and Foreteller, a strong Group 1 runner and has won on a wet track in the past. The track is expected to be soft for the race, causing Lloyd Williams to withdraw his two runners, Green Moon and Mourayan, from the race, bringing the total number of runners in the race to just nine. As mentioned above, the best racebook to place a bet on the 2014 BMW is Bet365.com, who will offer the best odds on the race. When visiting Bet365.com, click on ‘Horse Racing’ in the left sidebar and scroll down to the Antepost section of the page, where you will find the markets for this race and many more. The BMW Stakes (HE Tancred Stakes) is a Group 1 race for horses aged three and older, and is run over a distance of 2,400 metres at the Rosehill Gardens Racecourse. The race has a purse of $2,250,000, and was won by Fiveandahalfstar in 2013.